Ireland booked their quarter-final place at the World Cup but only after having to withstand a strong challenge from a Sergio Parisse-inspired Italy. Keith Earls's 19th-minute try helped Ireland lead 10-3 but a second Tommaso Allan penalty cut the margin to four. Ireland needed a last-ditch Peter O'Mahony tackle on Josh Furno to stay ahead after the break. Allan's third penalty reduced Ireland's lead to the minimum before two relieving Johnny Sexton kicks in reply. Better line-out work from the Italians could have seen them earn a shock victory with the Irish making three vital steals during the contest. Ireland needed another heroic performance from lock Iain Henderson as his series of carries were in marked contrast to the largely ineffective efforts of the Ireland back row. Scrum-half Conor Murray had an afternoon to forget as many of the struggles of Ireland's warm-up matches re-emerged. After Italy's insipid effort against France and struggle to overcome Canada, most pundits were expecting Ireland to win by a similar margin to the 36-6 victory at the last World Cup. However, as Quintin Geldenhuys predicted on Friday, the return of captain and number eight Parisse made the Italians a totally different proposition. The Stade Francais star showed his intent from the off by running at the Irish defence and even demonstrated a canny kicking game as the contest went on. Parisse was superbly supported by his back-row colleague Simone Favaro while scrum-half Edoardo Gori dominated his battle with off-colour Murray. The Irish needed a series of vital line-out steals and Henderson's heroics to keep the Italians at bay. Four points down at the break, the Italians looked set to take the lead on 48 minutes as Furno drove for the line but O'Mahony produced a vital intervention to push the lock into touch. With mistakes starting to litter the Irish display, Allan's third penalty cut the margin to 10-9 on 52 minutes as Joe Schmidt's side were looking more than a little edgy. Two Sexton penalties either side of the hour gave Ireland breathing space but they endured a nervous finish as O'Mahony's yellow card saw them completing the game with 14 players as Italy continued to threaten despite Parisse's 65th-minute substitution. Sergio Parisse, Simone Favaro and Edoardo Gori all have legitimate claims to being named man of the match but Irish lock Henderson edges it as, without his contribution, Joe Schmidt's side would have lost their game. Henderson's carries and ferocious appetite for work around the breakdown helped to make up for some of the short-comings of the Ireland back row. Indeed, the Ulster man's performance may lead to renewed suggestions that he should be moved to one of the flanker berths. 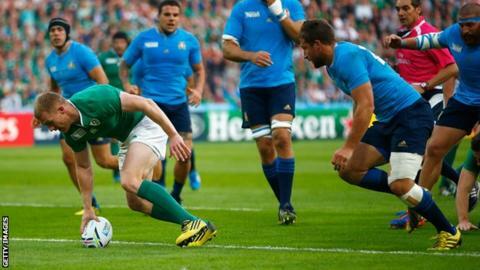 Ireland boss Joe Schmidt: "That game was exactly what we expected. We have been allowed to cruise through the first two games and it was a shock to the system to come against a tier one side who needed to win to stay in the tournament. "I said last week we would take a one-point win, so a seven-point win is good enough. "France are another level up - we will have to raise our game again. We will work on that this week and hopefully come up with the goods." Ireland face fellow quarter-finalists France in Sunday's Pool D decider at the Millennium Stadium. On the basis of this display from a virtually full-strength Ireland team, France will fancy their chances of winning in Cardiff. The losers would probably be handed the daunting task of facing New Zealand in the last eight. Ireland: Zebo; Bowe, Earls, Henshaw, D Kearney; Sexton, Murray; McGrath, Best, Ross, Henderson, O'Connell, O'Mahony, O'Brien, Heaslip. Replacements: Fitzgerald for Earls (76), Healy for McGrath (58), Cronin for Best (70), White for Ross (58), Toner for Henderson (67), Henry for O'Brien (67). Italy: McLean; Sarto, Campagnaro, Garcia, Venditti; Allan, Gori; Aguero, Manici, Cittadini, Geldenhuys, Furno, Minto, Favaro, Parisse. Replacements: Canna for Allan (65), Palazzani for Gori (76), Rizzo for Aguero (62), Giazzon for Manici (42), Chistolini for Cittadini (62), Bergamasco for Favaro (67), Zanni for Parisse (65), Benvenuti for Garcia (4).